The font family Univers is one of the greatest typographic achievements of the second half of the 20th century. The family has the advantage of having a variety of weights and styles, which, even when combined, give an impression of steadiness and homogeneity. The clear, objective forms of Univers make this a legible font suitable for almost any typographic need. It is used in a modified version by the new Swiss International Air Lines (previously, Swissair used the typeface Futura), Deutsche Bank and for signage all over the world. Also was adopted by the 1972 Summer Olympics organizers for its image and emblem also in 1976 Summer Olympics. General Electric used the font from 1986 to 2004 before switching to GE Inspira. Apple Inc. previously used this typeface as well as its condensed oblique variant for the keycaps on many of its keyboards, before completely switching to VAG Rounded in August 2007 with the introduction of new keyboards and the new iMac (their notebook computers already featured that typeface since 1999). Munich Re used a custom version of Univers until 2009. Univers is known for its clear lines and legibility at great distances. 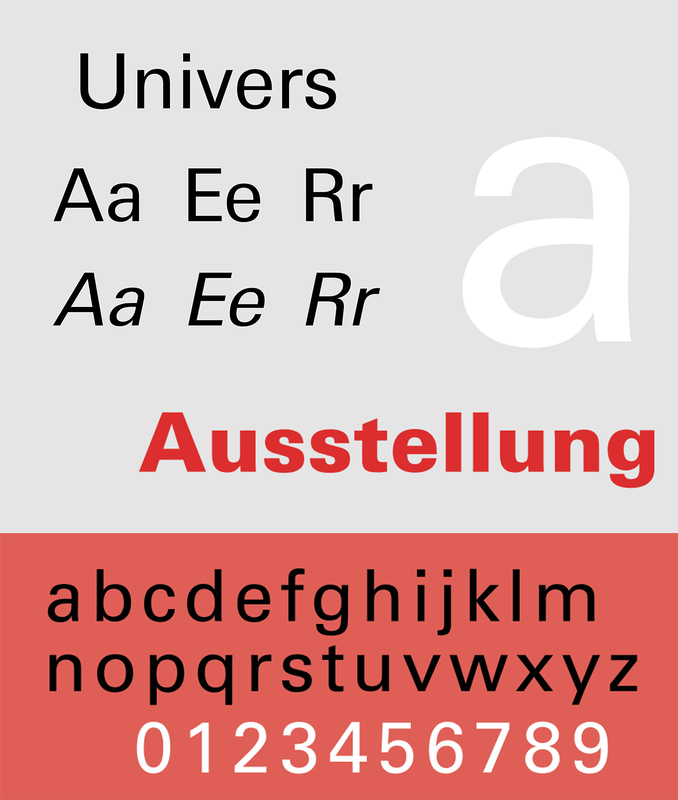 The Montreal Metro, Bay Area Rapid Transit, various Toronto Subway and RT stations, Frankfurt International Airport and the Walt Disney World road system also make extensive use of this typeface (though Disney is in the process of replacing it with Avenir). Univers was used for George W. Bush’s campaign logos in both 2000 and 2004. Bush’s 2000 campaign logo was set in Univers 85 Extra Black, while the 2004 campaign logo used Univers 85 Extra Black Oblique (slanted).